You are currently browsing the tag archive for the ‘drawstring’ tag. I recently bought a pair of flight socks, my third! First pair which were really good, and I forgot the brand, decided to go into hiding. I searched every nook and cranny in the apartment but it was no where to be found. I felt kinda heart pain since it worked well. So I went and bought a 3M pair as replacement. These ones aren’t too good, I think they aren’t as ‘supportive’ hence after a flight my legs feel very swollen still. And so I got a third pair. I got these OPPO Medical ones from Guardian Pharmacy. Err… not advertising for them but for the interest of those who are looking to buy a pair. I think these are quite good. Better than the 3M ones. Anyway, they usually don’t come with any pouch and since I’ve already misplaced/lost a first good pair, I didn’t want to lose these again. 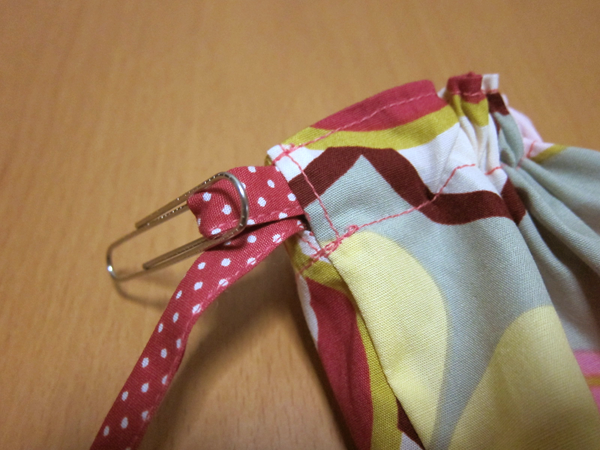 So I decided to make a ‘striking’ pouch so I can see and find them easily. 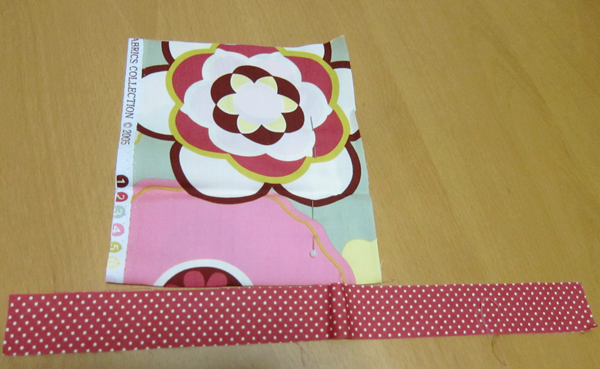 I used this gorgeous Alexander Henry Kleo fabric and a pink polka dot fabric (from Spotlight) for the drawstring. I didn’t even draw any template! I thought it was gonna be so simple anyway. And it was! But for those who would like a template, just drop me a note, I will do a quick sketch and email it to you ok?! I’m thinking of adding some embroidery details or something to it. Hmm… waiting to be inspired. Any suggestions? Although it was a quick one-hour project, I actually felt relieved. ;D I’m meeting a few friends this sat for a sewing get-together over gelato and cakes. Now what should I sew? I did the double wrapping to seal the frays. 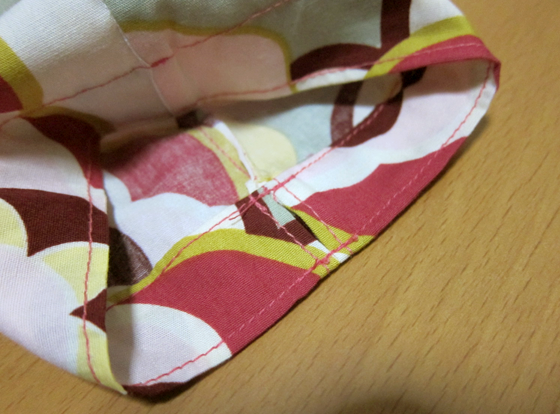 Sewing one side first, then flip over, and sew again to tuck the frays in. 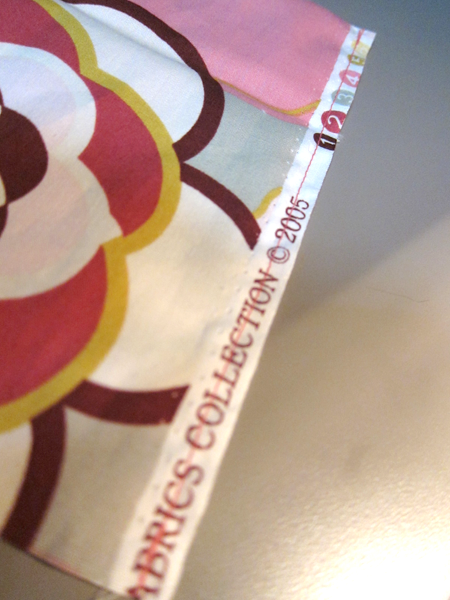 Measure the top where your drawstring area is and leave that unsewn. Fold the edges making sure the frays are tucked inside. 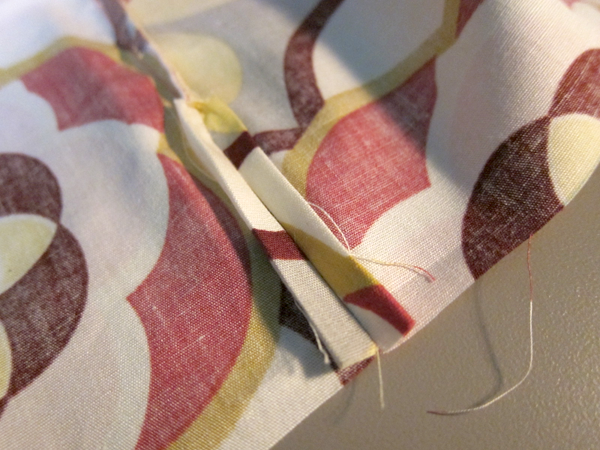 Sew a rectangle to secure the 'hole'. Do the same for the other side. 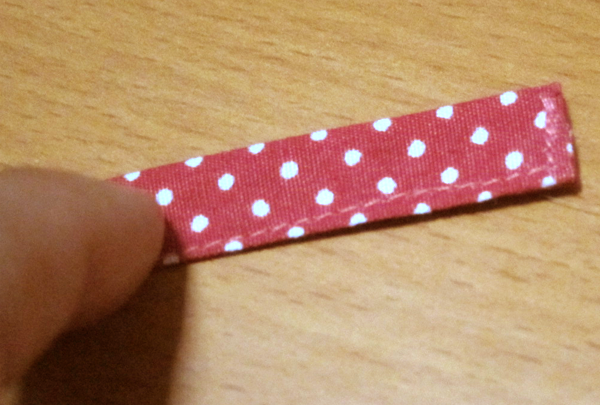 As I chose to draw the string from one side only, I did not leave any gap on this side. 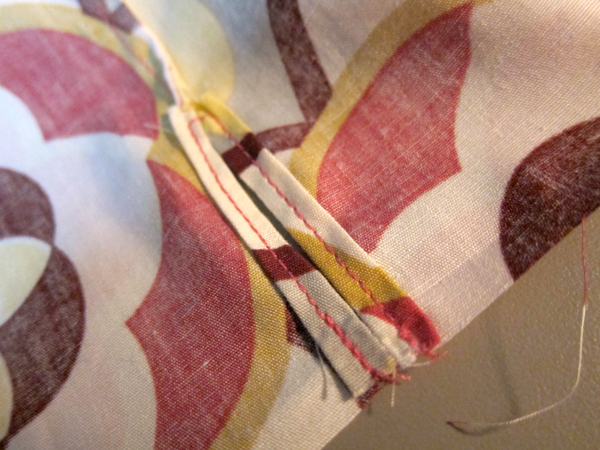 Similarly, double sew to hide the frays. 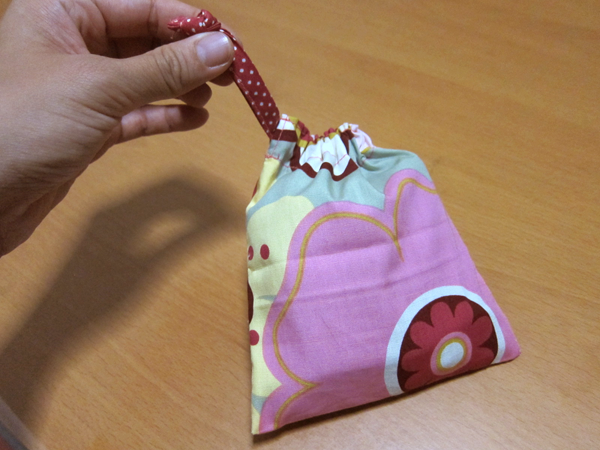 Fold the top towards the inside of the pouch, hiding the frays inside. 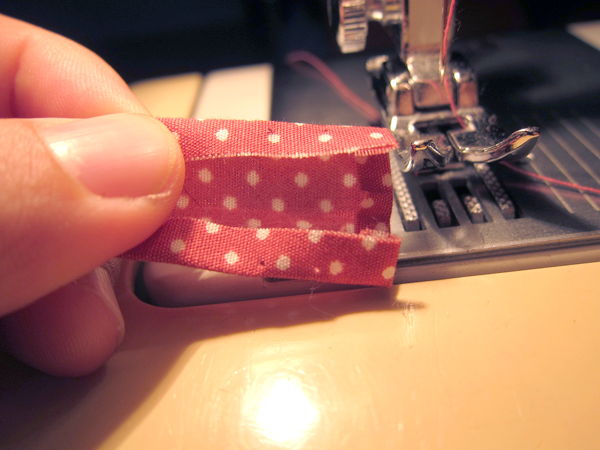 Sew two lines across the top. 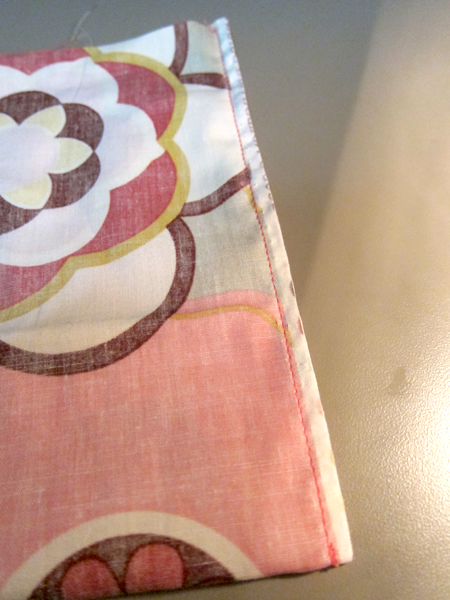 You don't really need to sew the top line nearer to the opening, but I wanted this look. 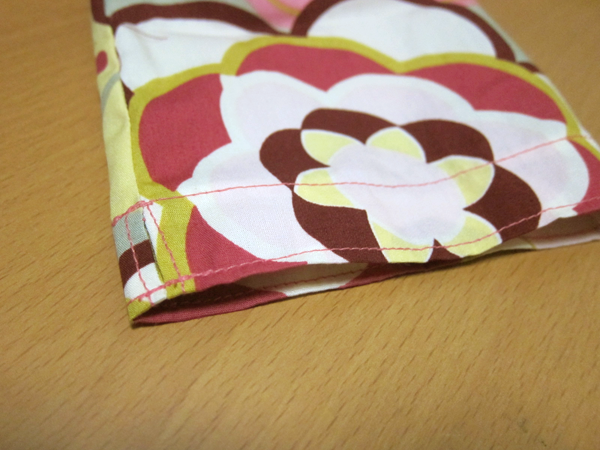 Pouch is almost done. We need the 'string' now. 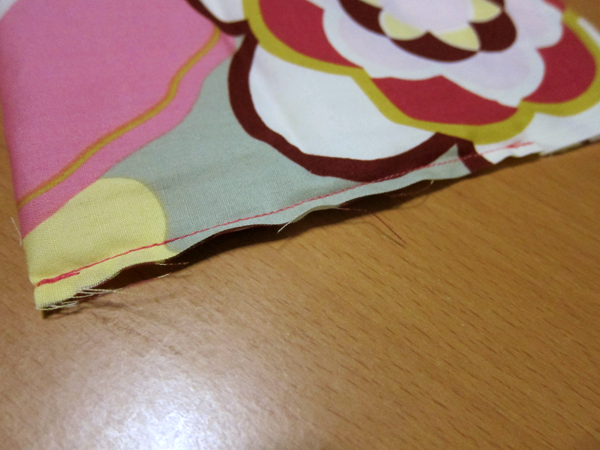 Sewing the 'string'. 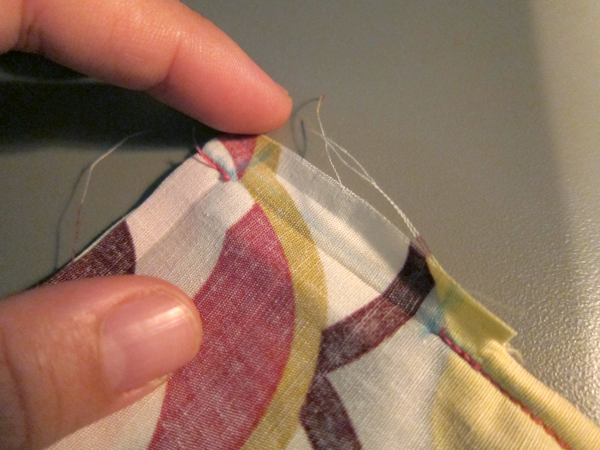 Fold the fabric and use needles to hold it together. 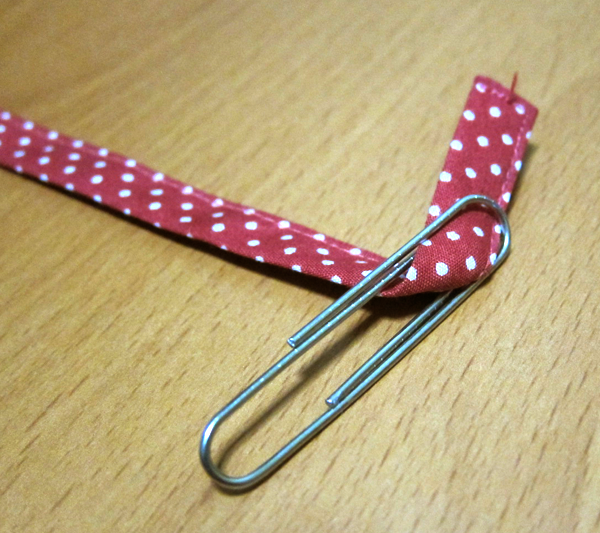 I used a paper clip to guide the 'string' through. There... my flight socks sits safely in it.